The state of Texas still wants to take my son’s life even after all the facts of his innocence were presented in court. A world-renowned pathologist testified that my son — Rodney Reed — couldn’t have committed the murder of Stacey Stites. But the state of Texas refuses to DNA test all the evidence. DNA put my son on death row, but we now know that DNA had nothing to do with the murder — it was old. And the jury wasn’t told all the results. For example, the jury never learned of a state DNA report from the time of my son’s 1998 trial of beer cans found at the scene that excluded Rodney Reed and implicated two police officers and the deceased drank from the same cans. How can the state hide DNA evidence at his trial and then prevent testing it now? Why not test the remaining evidence, such as the belt they say was the murder weapon? Technology is far more advanced than it was 20 years ago and can go back thousands of years. Surely, they can go back 20 years. Tell me, what happened to the reasonable doubt? What happened to compassion? What happened to empathy? What happened to justice? My son didn’t receive any of the above. Why is Texas determined to take my son Rodney Reed’s life, based on old DNA, seemingly corrupt cops, lawyers, and yes, all of the state’s experts who said my son was guilty have since recanted their testimony. There’s no proof, all that remains is the age-old prejudice that a white girl wouldn’t be involved with my son. God said: “Vengeance is [His].” Texas, you have borne false witness against my son. Texas, how can you ignore all facts and findings presented to you? There is nothing saying that Rodney Reed committed the murder, and everything points to someone else. My son’s experience has opened my eyes to the fact that there are many innocent lives on death row. Corruption put them there — the same corruption that sent our old sheriff to prison, and that continues to cover up the abuse our community has suffered for generations. There should be no death penalty, and the justice system needs to seek the truth. The Reed family thanks the lawyers and all the supporters and prayers. God Bless you all. The Texas Court of Criminal Appeals recently issued a ruling in the Rodney’s case – ordering new a hearing in front of the Bastrop District Court. The hearing is set to begin on October 10 and run for 3-4 days. The hearing was granted to examine a witness statement uncovered in a yet to be aired CNN interview that further cast doubt on the whereabouts of Jimmy Fennell, Jr., who was Stacey’s fiance at the time of her murder, and who many consider to be the real perpetrator of the crime. “Reed’s attorneys say Fennell gave conflicting accounts about his actions the night his fiancé was strangled with a belt. Fennell told police he was at home the night of April 22, 1996, and the following morning. Fennell said he had been at home and fell asleep before Stites left early in the morning to drive from Giddings to an H-E-B grocery store in Bastrop, according to court records. She never arrived for her morning shift. The Court of Criminal Appeals has reviewed Rodney’s case many times, and leading up to his execution date, they ordered hearings to review whether or not Rodney should receive DNA testing on key items from the crimes scene. The hearings were held by the Bastrop district court, which recommended against testing, following which, the CCA denied his appeal and he received the March 5, 2015 execution date. However, that was halted based on new evidentiary claims. An appeal to grant the DNA testing was subsequently denied in 2016. This marks the first time since Rodney’s execution was halted in 2015 that there is a positive action from the courts regarding Rodney’s appeal. This latest piece of evidence is just one more link in the chain that binds Fennell to Stacey’s murder – and shows that Rodney is innocent! Rodney supporters will be working to build a presence at the hearings – as well as a series of activities to support Rodney over the next few months. Please check back at the upcoming events page here and on Facebook.com/texasinjustic for more information. This entry was posted in Courtroom News, Death Penalty News on July 17, 2017 by justice4rodneyreed. Texas’ highest criminal court Wednesday denied death row inmate Rodney Reed’s request for DNA testing on items related to the 1996 murder of Stacey Stites in Bastrop County. The 8-0 decision by the Texas Court of Criminal Appeals said the possibility of cross-contamination limited the usefulness of many of the items Reed wanted tested, and results from other items would not have resulted in his acquittal. The court also said that Rodney failed to prove that the request for testing “was not for the purpose of unreasonable delay”, a claim insulting on its face, but especially because this court waited more than two years to make this ruling. This denial is disheartening, but it is separate from Rodney’s habeas petition also filed in February of 2015, based on new forensic evidence, that contests the timeline of the version of events claimed by the State. Follow the We Demand Justice facebook page for calls to action and next steps. The CCA’s full opinion can be read here. This entry was posted in Courtroom News and tagged #justice, Austin, Court of Criminal Appeals, Justice4Rodney, news coverage on April 12, 2017 by justice4rodneyreed. There have been few updates on this site since Rodney Reed won a historic stay of execution in February of 2015. His lawyers have filed motions and his supporters have held rallies. Rodney’s father passed away, his mother’s house flooded, and children and grandchildren have been added to the Reed family. But in TWO YEARS, the Texas Court of Criminal Appeals (CCA) has done nothing to look into the DNA evidence that it begrudgingly considered strong enough to warrant delaying an unjust execution. And still Rodney Reed, and innocent man, sits in a tiny cell on Texas death row. Rodney’s family and supporters will call attention to these disgraceful two years by holding a march and rally in Bastrop, Texas. Join us for a community cookout on Saturday, March 11, 3:00PM-9:00PM at the Kerr Community Center, 1308 Walnut St, Bastrop. Bring a dish or a cash donation for the potluck. Updated: Thanks to everyone who came out in the rain to show their support. We had our cookout indoors and spirits were high! This entry was posted in Protest and tagged Bastrop, Innocence, Protests on March 7, 2017 by justice4rodneyreed. It’s been one year since the Texas courts issued a stay of execution to Rodney Reed, an innocent man on death row. In that year, the courts have done nothing to correct their injustices while Rodney continues to live in a cage that measures only 60 sq ft, confined alone for 23 hours a day. On the anniversary of last year’s victory, we will remind the small town of Bastrop and the state of Texas that we have not forgotten. Justice for Rodney Reed and Justice for Stacey Stites! Join Rodney’s family, friends, supporters, and a film crew from A&E for a short march through Rodney’s hometown of Bastrop and a community potluck. 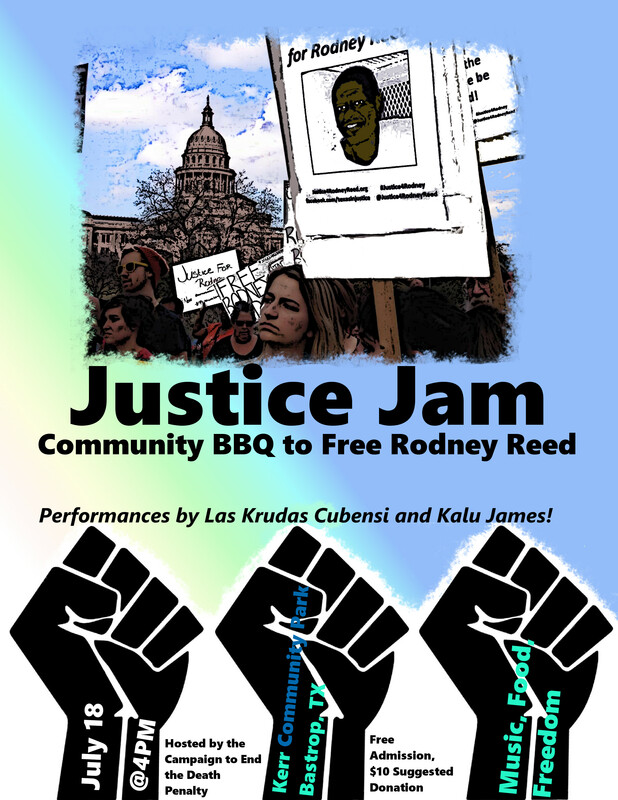 We’ll have music, Texas brisket, and a message for the Court of Criminal Appeals: We Demand Justice: Free Rodney Reed! There will be a carpool for those traveling from Austin to Bastrop. Sign up at https://goo.gl/KN5s4A to become a driver or secure a seat. Contact lily (at) nodeathpenalty.org for more information. This entry was posted in Protest and tagged Bastrop, Justice4Rodney on February 4, 2016 by justice4rodneyreed. Rodney Reed and his supporters are still waiting on a ruling from the Texas Court of Criminal Appeals (CCA). It’s been five months since the CCA put the brakes on Rodney’s scheduled execution while it decides if it will hear the explosive new evidence brought forward by Rodney’s lawyers; it seems that the wheels of Texas justice turn very slowly. But while the CCA stays silent, Rodney’s legal team and supporters continue our work to win his freedom. Join us in Rodney’s hometown of Bastrop for an afternoon of music and Texas BBQ in support of Rodney Reed. Featuring performances by: Kalu James, Las Krudas Cubensi, an original song written for Rodney performed by Rodney’s cousins, and a DJ set by Rodney’s brother Richard Reed. Money raised will go to Rodney’s legal defense fund and support campaign materials. See you in the park! This entry was posted in Protest and tagged Bastrop, Court of Criminal Appeals, Justice Jam, Justice4Rodney on July 10, 2015 by justice4rodneyreed.